On Saturday, January 22nd, the San Francisco Comedy College welcomed renowned comedian Brian Regan (http://www.brianregan.com) in a rare and intimate question-and-answer session. Held at the SFCC Clubhouse, this event marked the first installment of the SFCC’s new ”Comedians on Comedy” lecture series. More than 40 comedians and fans came to hear Brian discuss his 24 years of working as a stand-up comedian. Attendees were rewarded with sage advice, autographs, photographs and lots of laughs. Entertaining, stimulating and warm, Brian shared many hilarious moments throughout his career, from his worst experience with an insistent heckler to his first appearance on The Tonight Show with Johnny Carson. His very funny story seemed even more touching the next day with the news of Carson’s passing. Stressing the importance of getting laughs unique to who you are, Brian encouraged new comedians to ”be yourself, be real and to let the audience like you.” Sound familiar? The SFCC thanks Brian for taking time out of his busy schedule and sharing his afternoon with us. On Thursday, February 10, the San Francisco Comedy College welcomed respected comedian and actor Mark Lundholm (www.marklundholm.com) in an enlightening and moving question-and-answer session. Held at the SFCC Clubhouse, this event was the second installment of the SFCC’s new “Comedians on Comedy” lecture series. Honest, funny and visceral, Mark offered many words of advice, including the importance of remembering that 90% of show business is business, being likeable and learning to say no. He also revealed some deeply personal moments and was brutally honest about his experiences as a working comedian. He said that comedy is pain plus time and that the comedian determines how the relationship with the audience will develop, not the audience. If a comedian is iffy, the audience will lose confidence in the comedian as well. Attendees appreciated Mark’s straightforward style and generosity. The SFCC thanks Mark for sharing his evening with us. Headliners traveling through the Bay Area (SF, Santa Rosa, San Jose, Monterey, Sacramento, Fairfield) who want to share with the comedians of tomorrow can send an email to standupsf@aol.com and we will create an event for you! On Saturday, March 26 at 3pm, the San Francisco Comedy College hosted a funny and thoughtful question-and-answer session with Alonzo Bodden (www.alonzobodden.com), a respected comedian and most recently, the esteemed winner of Last Comic Standing 3. Held at the SFCC Clubhouse, this event was the third installment of the SFCC’s new “Comedians on Comedy” lecture series. More than 20 comedians and fans came to hear Alonzo give helpful advice to new and experienced comedians alike. Alonzo shared stories about working the road, how he progressed from opening clubs to headlining, and what it was like to participate in Last Comic Standing, a competitive reality show featuring stand-up comedians. “Never be surprised that you’re the smartest person in the room,” said Alonzo, getting a big laugh while describing what it’s like to be in a television network meeting. It’s important to remember that “Studios are not run by creative people, but businesspeople.” Talking about the importance of trusting his creativity, Alonzo stressed, “Never think on stage. Just be in the moment.” Sound advice from a great comedian. The SFCC thanks Alonzo for sharing his afternoon with us. 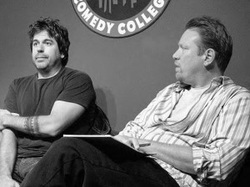 On Sunday, June 3, 2007, the San Francisco Comedy College (SFCC) welcomed well-known comedian Greg Giraldo, of Tough Crowd with Colin Quinn and The Greg Giraldo Show, and Giraldo’s current feature act on his national tour, Jesse Joyce, of the Comedy Addiction Tour, in an entertaining and enlightening interview with SFCC CEO Kurtis Matthews, followed by a question-and-answer session with the audience. Held at the SFCC Clubhouse, this event was the latest in SFCC’s ongoing “Comedians on Comedy” series, which has previously featured such renowned comedians as Brian Regan, Alonzo Bodden, Maria Bamford and Chris Titus. More than 25 comedians and fans came to hear Greg and Jesse share their stories about working on the road, the changes in the stand-up industry over the past two decades and the differences between the Los Angeles and New York City comedy scenes as well as their experiences juggling jobs, family and a personal life with the day-to-day reality of being a professional comedian. Jesse wanted to be a comedian from very early on and talked about a video of himself as a kid saying to the camera, “I want to tell jokes.” An uncle who did stand-up for a short while was a great inspiration, so he started working on his act. Moving to New York City shortly after college and taking any job that he could quit at a moment’s notice to take advantage of any opportunity to do stand-up, Jesse was focused on doing as much as stand-up as possible. “I knew that I had found my voice when I stopped talking about things that I thought were funny and started to make things that I wanted to talk about funny.” There was a very funny moment when in describing how hard and long the journey of doing stand-up is, Greg said, “then you (finally) get funny, then Dane Cook comes along…”, suggesting that Cook does not necessarily focus much on stand-up. The SFCC thanks Greg and Jesse for sharing their Sunday afternoon with us.